I am immensely proud to Chair BASICS particularly in its 40th anniversary year. I am sure that our founders would be proud of the Association’s continuing role and we look forward to celebrating this milestone at this year’s conference. That said pre-hospital care is now a multi-faceted and somewhat confusing area of work. Across the different NHS Ambulance Trusts different models of care have emerged that bring together associate practitioners, volunteer ambulance crews, technicians, paramedics, nurses, doctors and community first responders. Care is delivered via a range of transport platforms. The one thing that stands out in all of this is whilst none can deny the huge strides made by the statutory services) in increasing survival and subsequent quality of life (including through the delivery of enhanced and critical care provision), the role of BASICS responders remains a much-valued resource across the UK. There are those whose focus has shifted to particular models of enhanced and critical care and who would decry and denigrate the role of the traditional volunteer BASICS responder. Within this it is important to remember that survival is not just about the delivery of the most complex and advanced care providers but also about the timely intervention of those available to assist so as to stabilise and optimise the patient(s) for onward care which may include critical care in whatever guise. 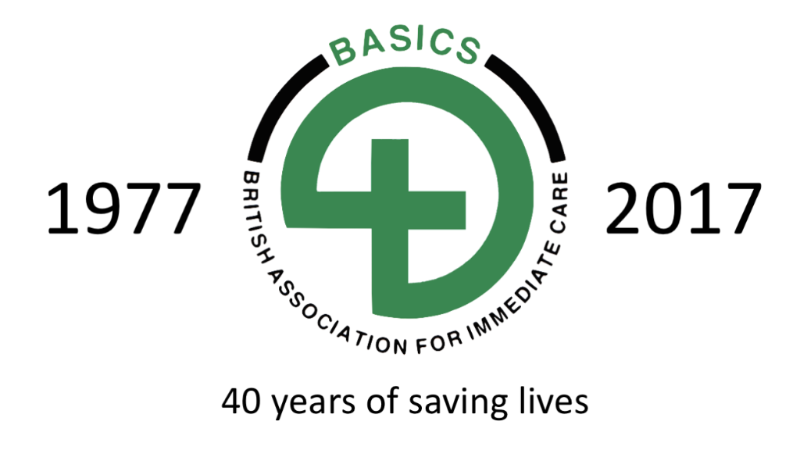 BASICS, the brainchild of Dr Ken Easton in 1977, came about precisely because there was a gap in prehospital care provision. The gap may have changed shape but it and its challenges remain as strong and as relevant today as they were then. We all recognise that society is changing, there are more older people enjoying many more years of active life and this, in turn brings a range of complexities to health care. Silver trauma is on the increase, much of it occurs within the home, results from comparatively minor falls or injury and provides very significant challenges to our emergency services. It’s not the volume but the co-morbidities and changed physiology that proves so very challenging. BASICS remains the backbone of early on scene, enhanced and critical care across the UK. Our members are called out on a daily basis as numerous Twitter feeds testify. Yet there are many more working out of the limelight providing equally valuable services. BASICS is largely hidden from public sight as we are so well integrated that we simply merge into the background of multiple emergency services personnel and vehicles on scene. It’s no wonder therefore that individuals, including some of our own members, start to question our ongoing role. You demonstrate your ongoing support of prehospital care through membership of the UK’s premier professional Association with like-minded committed individuals. BASICS promotes, provides and educates. Without you and your involvement that would not be possible. BASICS as an organisation was accorded the privilege of directly nominating it’s eligible members as recipients of the last two Jubilee medals celebrating HM Queen Elizabeth II’s reign. We are the only non-statutory organisation accorded this privilege. We are all familiar with the Care Quality Commission and its mandate to improve care. While we support the aims of this important monitoring body wholeheartedly, without the work of BASICS, Schemes would have had to register individually and many, perhaps even yours, would have had to close due to the increasing and ongoing financial burden. Without BASICS fighting your corner individual responding members would not be able to use emergency blue lights. BASICS is regularly invited to participate in a range of guideline and regulatory development. Our voice was prominent in the support to the proposal to extend prescribing to paramedics, the recent AAGBI prehospital anaesthesia guidelines, the Delphi group on prehospital fluid management and the various Faculty Consensus statements. For those involved in mass gathering medicine the current deliberations on levels of first aid and medical cover at events and stadia have gained much from our involvement. The reason our Schemes and its members can respond is because of nationally agreed relationships. If BASICS was not there the national guidance and support for volunteer prehospital care providers would be lost. Where would this leave you? Being part of something that genuinely does make a difference, whilst promoting and driving our own area of practice and interest is a huge privilege. It is not without cost but the changes that have occurred within the UK’s prehospital and ambulance services over the last 40 years owe much – and probably much more than most realise -to BASICS. That said we cannot rest on our laurels. As you read this the Executive Council is working to develop a 5-year strategy that will secure the future of BASICS and its members for the next 40-years. We need to understand ‘our fit’ in today’s prehospital schema. Our young members have different expectations of their involvement in prehospital care than many of our established members had when they first joined. The changing nature of prehospital care provision demands different preparation pathways. BASICS is and will remain the preeminent Association for all prehospital practitioners no matter their professional discipline, speciality or area of practice. I am really grateful for your continuing membership as it is literally true that we cannot achieve what we do without your support. However and wherever you provide prehospital care, and in whatever capacity or whether you simply have a strong interest in prehospitalcare, I invite you to go further. Share your skills and expertise with our community, help to improve care and bring about change. Consider helping us, as a respected expert national organisation, to go further, change faster and improve more by becoming more active in our national work and keeping us at the forefront of this amazing world of prehospital care for the next 40 years and more. Interested? – then email in the first instance to admin@basics.org.uk and do look out for opportunities to get involved. The MHRA has issued a warning regarding Oxylog 3000 and Oxylog 3000 plus ventilators and a risk of failure. Save the Date! Conference 2017! The Conference committee are working hard to put together an exciting programme. Watch out for updates on our website and social media channels! This being our 40th anniversary will be a celebration of the achievements of our dedicated members and will be an unmissable event. The Paediatric Pre-hospital Emergency Care (PPhEC) Course is open to all those who have completed the PhEC or other appropriate pre-hospital care courses. Three Day PhEC courseA three-day course on all aspects of emergency care in the pre-hospital setting including medical, obstetric and paediatrics as well as trauma emergencies and incident management. Two Day Advanced PhEC CourseThis two-day course for previous participants on the Pre-Hospital Emergency Care course develops and enhances the necessary skills to deal with medical and other emergencies encountered in all fields of pre-hospital care. The course covers all aspects of immediate care with the emphasis on practical skills as well as formal lectures and training scenarios. The first three days comprise the PhEC course and forRCSEd.Succesful candidates certification is awarded by the Royal College of Surgeons of Edinburgh. This popular two-day course is directed at previous participants on the Pre-Hospital Emergency Care courses and the Immediate Care Courses to ensure that skills are maintained and updated to incorporate the latest developments in pre-hospital care.